Laos, 1979: Dr. Siri Paiboun, the twice-retired ex-National Coroner of Laos, receives an unmarked package in the mail. Inside, is a hand-woven pha sin—a colorful traditional skirt worn by women in certain northern Lao tribes. A lovely present, but who sent it to him, and why? More importantly—and alarmingly—why is there a severed human finger stitched into the sin’s lining? Gallows humor aside, Siri’s curiosity is now piqued. He’s convinced someone is trying to send him a message—or perhaps a warning?—and refuses to let the matter rest until he’s figured out the meaning of it all. “Luang Nam Tha?” said Siri. Easier said than done. This is a time of war with rising tensions in the region between China and Vietnam, and travelling is precarious at the best of times for most people. However, the unconventional Dr. Siri Paiboun is not most people. He is in the know, and knows how to manipulate that know when time dictates. His unconventional methods also include the occasional use of blackmail—but only if absolutely necessary— to get his way, and throwing live hand grenades at certain targets when he is irked. Too long a journey to embark upon on his beloved and trusty Triumph motorcycle, he decides the only mode of transport will have to be via airplane, despite the fact that the only aircraft in the country belong to the military and state. Before long, his reputation has secured transport for Madame Daeng and himself. And as they take flight in search of answers, little do they realize that very soon they will be flying into a storm of deadly danger. Other characters from the series make an appearance in the story, chief of whom is the omnipresent Inspector Phosy. He has been sent to the same area to investigate a double murder and finds himself having to confront some villainous characters. 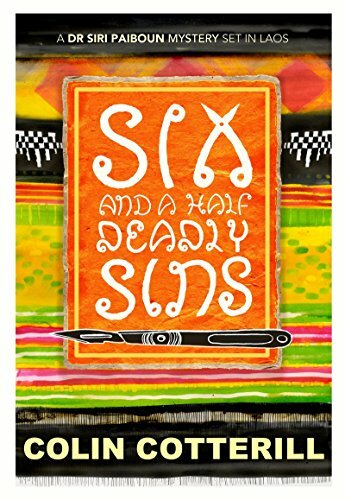 Six and a Half Deadly Sins is the tenth book in the popular Siri Paiboun series. It is a terrifically entertaining ride with great atmosphere, zany and original characters. The exotic scenery, smells, and location are so authentic you will genuinely believe you are in the heart of Laos with the good doctor and his cohorts. If this is your first Paiboun book, don’t be in the least surprised if you go searching for the rest in the series.